A monumental synagogue building dating to the Late Roman period (ca. 4th-5th centuries C.E.) has been discovered in archaeological excavations at Huqoq in Israel’s Galilee. The excavations are being conducted by Jodi Magness of the University of North Carolina at Chapel Hill and David Amit and Shua Kisilevitz of the Israel Antiquities Authority, under the sponsorship of UNC, Brigham Young University in Utah, Trinity University in Texas, the University of Oklahoma and the University of Toronto in Canada. Students and staff from UNC and the consortium schools are participating in the dig. Huqoq is an ancient Jewish village located approximately two to three miles west of Capernaum and Migdal (Magdala). This second season of excavations has revealed portions of a stunning mosaic floor decorating the interior of the synagogue building. The mosaic, which is made of tiny colored stone cubes of the highest quality, includes a scene depicting Samson placing torches between the tails of foxes (as related in the book of Judges 15). In another part of the mosaic, two human (apparently female) faces flank a circular medallion with a Hebrew inscription that refersto rewards for those who performgood deeds. 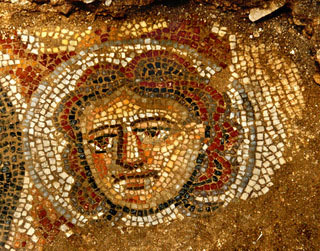 “This discovery is significant because only a small number of ancient (Late Roman) synagogue buildings are decorated with mosaics showing biblical scenes, and only two others have scenes with Samson (one is at another site just a couple of miles from Huqoq),” said Magness, the Kenan Distinguished Professor in the department of religious studies in UNC’s College of Arts and Sciences.